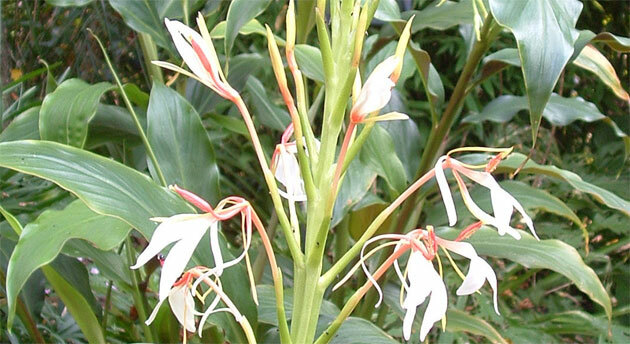 Spiked Ginger Lily is growing up to 1-1.5 m, with leafy stems. Flowers are white with an orange-red base, fragrant, appearing in a dense spike, up to 25 cm, at the apex of the stem. Flower tube up to 6.5 cm long. Leaves are oblong, up to 1 feet long and 12 cm broad. A perfume named Abeer is getting from the root stock. To treat liver complaints, used as a blood purifier, treat skin problems, stomach trouble, inflammation, vomiting, and dysentery.